Grey Terror and Silver Dart both initially served with 14 LAMB in Mespot. Impregnable, Desmond, Cleopatra, Harvester, Avenger, Chatham were with 6 LAMB in 1920 befoere is was absorbed by No 1 ACC. I have a fair amount of material on RRs gathered over the years and so do please PM me with the specific inoframtion you are after and I wil do what I can to fill in gaps. Regarding the L.A.M.B war diaries, can anyone let us know what happened to 14th L.A.M.B on this day 1920? 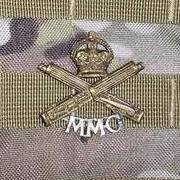 Note the casualties below are all MGC(M) and no ASC. maybe the loss of two armoured cars? All are buried in North Gate Baghdad. Let's remember them. (Served as TAYLOR). Son of Alfred and Sarah Andrews, of Thorrington, Essex. Son of Alfred Carr Booth and Florence Booth, of 651, Chesterfield Rd., Woodseats, Sheffield. Son of James and Mary Louisa Earl, of Thorpe Malsor, Kettering, Northants. Son of George Alfred and Flora Woodhouse, of 76, Victoria Avenue, Barrow-in-Furness, late of 53, Dundee St.
My wifes grandfather John William Flower was in 6th LAMB, 17th Indian Division. 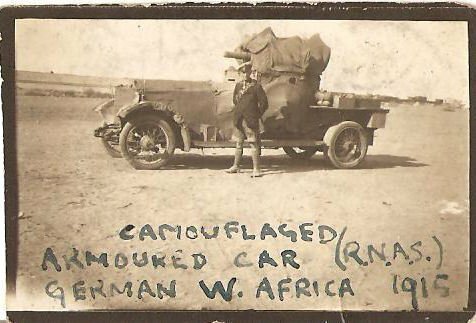 His RR armoured car was called Cleopatra, there is a picture on my post "armoured cars, baghdad"
Dominic, if I could trouble you a bit further, what dates are associated with the identification of these cars in the war diaries? Only just checked back, the war diaries only survive from April 1918 so all I can give are dates of 1st mention (this of courxe doesn't mean they weren't around-it is clear form the diairies that mention of vehicle numbers is spasmodic). 1. The number series for armoured cars and tenders from a unit seems to be a single sequntial series-this is clear from the 300's where LC341 & LC369 (tenders) are part of the same series as LC's 336,339 & 340 (A.C.'s). this would also suggest they came form the same unit. 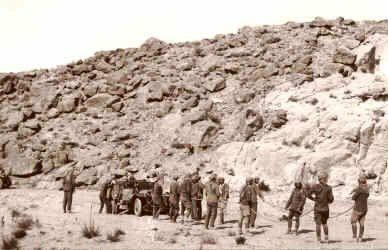 The Wolesley tender is identifiable as part of the reenforcement of the Hedjaz Armoured Car Battery by 2 Roll-Royce Armoured cars, a Wolesley tender and 6 Ford cars that reported for duty at Aqaba on the 5th May 1918, supplied by No.1 Battery Armoured Cars. This would suggest the LC300 series was for No.1 Battery cars . 2. This would make the LC0800's the 10 (RN) Armoured Motor Battery cars. 3. Which unit did tenders LC1005, LC1105 (I am suspicious of these 2 and wondering if there is a diary typo and that they may be one vehicle?) & LC1298 come from? This is the other way round from your idea Mark, but I think the Wolesley is the clincher. Thank you very much for checking the war diaries and posting this information. It is of great help. Your tentative conclusions are very interesting as well. On a related note and in response to David, the book Steel Chariots in the Desert was written by a member of the Duke of Westminster’s armoured car unit and mentions the transfer of some Rolls Royces to the Hedjaz Armoured Car Battery. The Duke’s unit originated as the No. 2 Squadron of the Royal Navy Air Service’s (RNAS) Armoured Car Division (RNACD). This 12 car unit was transferred en mass to the Army in 1915 and formed Nos. 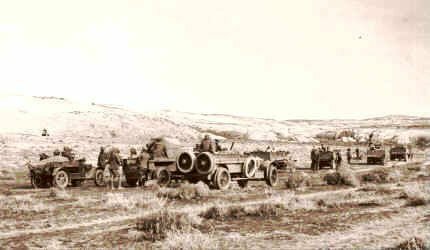 1, 2, and 3 of the Armoured Motor Battery (AMB) of the Machine Gun Corps (Motors), each battery being composed of four cars. The book’s author mentions the names of four cars: Bitter, Blast, Bloodhound, and Bulldog (or Bull Dog) which formed one such battery. The author states that two of the cars, Blast and Bloodhound, were eventually converted into tenders in Alexandria, Egypt and then transferred to the Hedjaz Armoured Car Battery. I do not have the book here with me right now, but we can check it for the date of this transfer and see if we can use this to associate these names with a short list of car numbers or specific units. By the way, it is not stated in the book, but I suspect that the fact that all four of the cars’ names begin with the second letter of the alphabet is indicative of their being a battery "B" or a "No 2" unit when named ("2"="B"). - Any thoughts on this are welcome. I am updating my database with new information that you and others from here at this forum have provided. I am also going through my image collection to make sure the database is as complete as possible. I have recently found a way to include photographs of identified cars within the database itself, so it is becoming more interesting visually while increasing in coverage as well. I hope to make this database available online soon - if I can find an easily accessible (and free) place to do it. At the moment the database is a Microsoft Excel spreadsheet of just over 11 Megs in size, but I anticipate that it might grow to twice that size once I have entered in all of the photos of identifiable cars that I have. Regarding the origins of the cars, my grandfather's unit 8th L.A.M.B was formed in France by the merging of 8th and 9th A.M.Bs two months prior to shipping to Mesopotamia. I don't know which unit he was in prior to the merger or the M.M.G battery before that. It looks like both these A.M.Bs had ex RNAS cars. Unfortunatly on none of my own pictures are there any names or numbers visible even on the normal places. In post 13, looking at the list of names, there is a high percentage which are also Royal Navy warship names... obvious ones being Renown,Repulse and Thunderer even some of the "later cars" like Chatham and Cerberus, which may be a pointer to thier origins. I would think it would have been bad form to change the name, even though the changed hand several times. I'm at work now, but I'll go down the list and hightlight the ones and copy back to you. Thank you for cross referencing the ship names found among the armoured cars. I look forward to seeing what you turn up. It seems likely that the names of at least these cars date from the Royal Navy period. Also, in his book Steel Chariots in the Desert, S.C. Rolls identifies "Blast", "Bloodhound", "Bull Dog", and "Bitter" by name during the period in which he was a petty officer in the Royal Navy based at Wormwood Scrubbs, London, England. Given the common origin for the 1914 Pattern cars at that facility, one would expect some uniformity in naming convention. I agree that once named, cars tended to keep their names. However, it remains possible that some cars were either renamed or not initially named until later. So far, in putting together my database of identified cars, I have come across a few exceptional cases. For example, I have found two photos of a car in RAF service, clearly named "Euphrates" in both photos, where one is a 1914 Pattern with updated chassis and the other is a 1920 Pattern. This is not just a case of a swapped turret (which did occasionally occur). The radiator shields, driver's visor shield, and the position of the side vision ports all point to these being two different cars. Unfortunately, these two photos are not dated, but I suspect that this case represents the replacement of a worn-out car with a newer model that was then named in honor of the retired car. Similarly, I have come across labeled photos showing the names "Carisbrooke" and "Cambrai" being used first for 1914 Pattern cars, then 1924 Pattern cars. Interestingly, cars by these names are shown together in one photo as 1914 Pattern with RAF roundels and then together in another photo as 1924 Pattern Army cars. I am not sure what to make of this cross-service naming coincidence. I suppose that it is possible that cars in the two services could have carried the same names simultaneously. In most cases, though, there appears to be continuity in the names of cars. Names seen on 1914 Pattern cars usually continue to be seen on 1914 Pattern hulls, even as the underlying chassis are replaced with newer ones over the years. I have some photographs of Armoured Cars, suggestions are that they may have been taken in India, they are of the 7th Armoured Car Company and include Rolls Royce armoured cars with spoked wheels, these are named as Silver Knight, Silver Dart and Silver Cloud. there is also a Rolls Royce 40/50 tender which looks like a de-armoured car, a Rolls Royce Admiralty pattern motorcycle, an Albion A10 3 tonner, a Bristol F2B Fighter Plane, a Ford 7 Tourer and some Crossley 1923 India Pattern Armoured Cars, one ofwhich is named "Arion" and written on the back is "One which escorted the Viceroy to the Frontier and back", they came together with various photos and postcards. Thank you for this very useful information! I will update the database immediately. 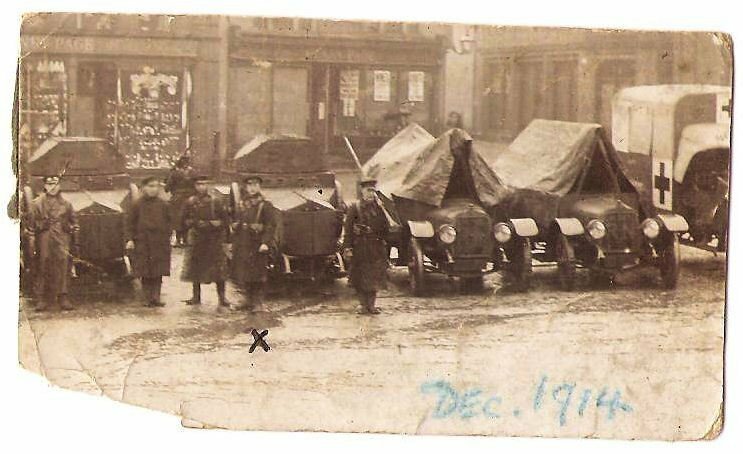 Do you have any information as to the dates for the photos showing the named Rolls Royce armoured cars? I would encourage you and others on this forum to share scans of your photos showing Rolls Royce armoured cars. If you need a place to post them, I have a Photobucket account and would be happy to do so. Please feel free to contact me via personal message if you are interested. This list is an excerpt from the database I am putting together. If anyone sees any errors or omissions, please bring them to my attention! As an extra I flicked through my copy of Seven Pillars of Wisdom and there is a side on photo of a RR tender at Akaba in 1918 and intriguingly the number on the side appears to be LC342-but it is not clear due to grills on the side of the bonnet and the shadows- could be another tentative number? this is another Imperial War Museum photo. I took a look at the photo of the tender in my copy of Seven Pillars of Wisdom and cannot make out the last digit of the hull number either. Thank you for mentioning the armoured cars that were converted into RR tenders. I will include their numbers and names in the database as well. David Murdoch was kind enough to compare the names of the armoured cars with Royal Navy ships that pre-existed WWI. As you can see below, most of the names have possible Royal Navy ties (although David pointed out that many of these ships were relatively minor and therefor the name selection may be coincidental). The use of Royal Navy ship names may hint that these cars were named during their service in the RNAS units. Supporting this theory, acording to Steel Chariots in the Desert, Blast, Bitter, Bulldog, and Bloodhound were all named during their RNAS days and, according to David's research, all four of these names had previously been used for Royal Navy vessels. These are theoretical associations of actual names. Comments, corrections, and additions are very welcome. Acording to S.C. Rolls in his book Steel Chariots in the Desert, "Blue Mist" was a somewhat older Rolls Royce Silver Ghost touring car that was made into a tender - it did not start out as an armoured car. Unlike the the other cars, "Blue Mist" was apparantly not an "Alpine" chassis car. (The Rolls Royce "Alpine" was a heavy-duty Silver Ghost chassis developed in the years before the war for competition driving in the Alps. This chassis design became the basis for that used in the armoured cars.) As result, "Blue Mist" was a bit over-loaded/under-powered when equipped and loaded like the other, former armoured car, tenders. "Blue Mist" reportedly reverted back to the single rear wheel configuration, when possible, to reduce drag and maximize speed. Perhaps "Blue Mist" was Lawrence's favorite because it was not typically loaded as heavily as the others? It also looked a bit more like a civilian car. Also, I have learned that "Dhibban" is not only a desert place name, it literally means "flies", as in the annoying insects commonly found in the desert. 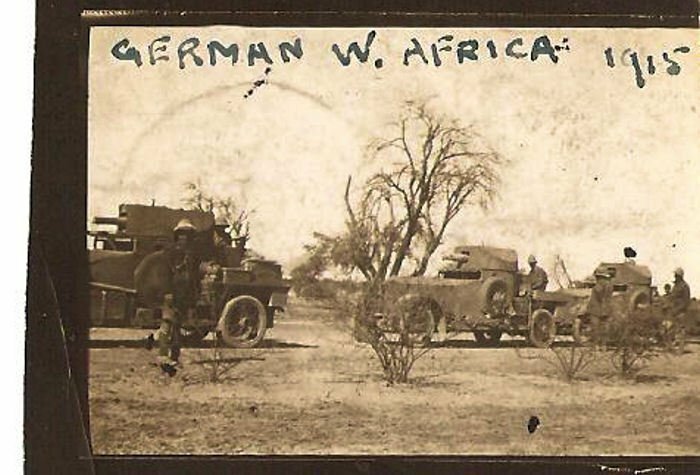 Given the other desert animal names used for cars, the "flies" definition, rather than a particular place name, may be the more correct source for this armoured car's name. Interests:11th (Lewisham) Btn Queen's Own Royal West Kent's. Hope you dont find this post irreverent but the sketch is by my grandfather sometime in 1917 while he was re-cuperating from his wounds received on the Sommme. As just a poor footslogger in the infantry I like to think that it gives a general view of how the Rolls Royce was perceived then, much like today. A little envious perhaps but not without humour. This is my first post to this site so please excuse any errors in my posting. My interest is actually WWII. I have been compiling a name / WD database used on vehicles used by the British, Canadian, Polish, Czech, Dutch etc for a few years. Names and numbers are sent to me from literally all over the world and a few of the most recent are Rolls Royce Armoured Cars. 3 Sqn Cockatrice, Camilla, Cordelia, Caradoc and Chesapeake. 4 Sqn Decoy, Diana, Dasher, Doris and Delight. Also a radio car called Columbine. The original source is from the AFV News. 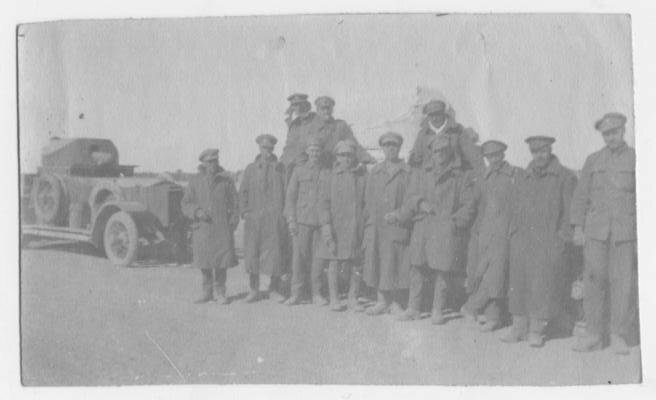 Armoured car Division "North Walsham Norfolk December 1914. Nice photos pomech. Have you seen his service register? Thanks for that, He was my Grandfather. This is a picture of men attached to 6th LAMB with Rolls armoured car "Cleopatra" in Mesopotamia. My wifes grandfather John William Flower was in the ASC attached to the LAMBs and it was his armoured car. Glad I can help. If he transferred into the RAF his service record for them may be in AIR 79/1823.